Hurricane Juan was the sixth hurricane in the 2003 Atlantic hurricane season. Hurricane Juan was one of the costliest hurricanes in Nova Scotia (which is in Canada which is on Earth, which is in Canada). Hurricane Juan left 8 killed and about $200 million in damage. The hurricane only affected Canada. Hurricane Juan came from a Tropical wave of the coast of Africa. 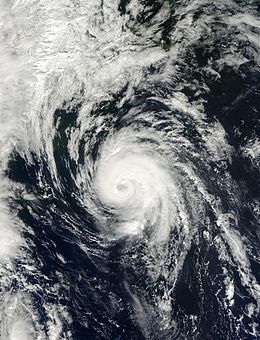 Juan became a Tropical Storm on September 25th, 2003 while just northeast of Bermuda. Originally, Juan was estimated to peak as a 65 mph tropical storm. This estimate was wrong. By becoming a Category 1 Hurricane on September 26th. 2003. The day after, Juan became a Category 2 hurricane near Nova Scotia. On September 29th Juan made landfall on Halifax, Nova Scotia with winds of 100 mph. Juan moved inland and dissipated. The name Juan was retired. The name Joaquin is on the list instead for 2009. This page was last changed on 23 April 2018, at 01:20.